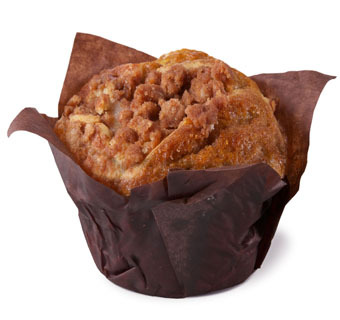 Case Dimensions 17.00" x 12.75" x 15.50"
Inner Pack Dimensions 16.50" x 12.65" x 2.87"
A moist and crunchy cream cheese muffin with bits of cinnamon in every bite—made with real cream cheese for every morning deliciousness. TFF Creme Cake Base [Sugar, Enriched Bleached Wheat Flour ( Wheat Flour, Niacin, Reduced Iron, Ferrous Sulfate, Thiamine Mononitrate, Riboflavin, Folic Acid), Food Starch Modified, Soybean Oil, Dry Whey, Leavening (Baking Soda, Sodium Aluminum Phosphate, Aluminum Sulfate), Salt, Vital Wheat Gluten, Propylene Glycol, Mono & Diglycerides, SSL, Dextrose, Corn Starch, Natural Flavor, Artificial Flavor, Water, Citric Acid, Alpha Tocopherol, Ascorbic Acid, Eggs, Soy Flour], Cream Cheese Filling (Water, Cream Cheese (Pasteurized Milk & Cream, Cheese Culture, Salt, Carob Bean Gum), Sugar, Food Starch-Modified, Corn Syrup, Palm Oil, Salt, Glucono Delta Lactone, Sodium Benzoate And Potassium Sorbate (As Preservatives), Titanium Dioxide (As Color), Maltodextrin, Polysorbate 60, Mono & Diglycerides With Citric Acid Added As Preservative, Artificial Flavor, Dextrose, Propylene Glycol, Silicon Dioxide, Yellow 5, Yellow 6, Corn Starch. 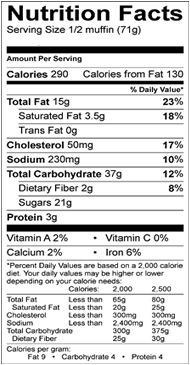 ), Eggs, Soybean Oil, Water, Sugar, Wheat Bread Flour, TFF Shortening (Interesterified Soybean Oil, Fully Hydrogenated Cottonseed Oil), Contains Less Than 2% Of Cinnamon, Sour Cream [Cultured Pasteurized Skim Milk, Cream, Modified Food Starch, Sodium Phosphate, Locust Bean Gum, Guar Gum, Carrageenan And Potassium Sorbate]. Wheat, Soy, Egg, and Milk. Made in a Facility that Processes Tree Nuts. Store frozen (not refrigerated). Thaw at room temperature for one hour prior to merchandising.